Today I have received a young plant of Clematis tashiroi from Taiwan. This plant is native in this country. There is also a very beautiful Clematis akoensis but not avaible. Congratulations on your new addition, Ton. 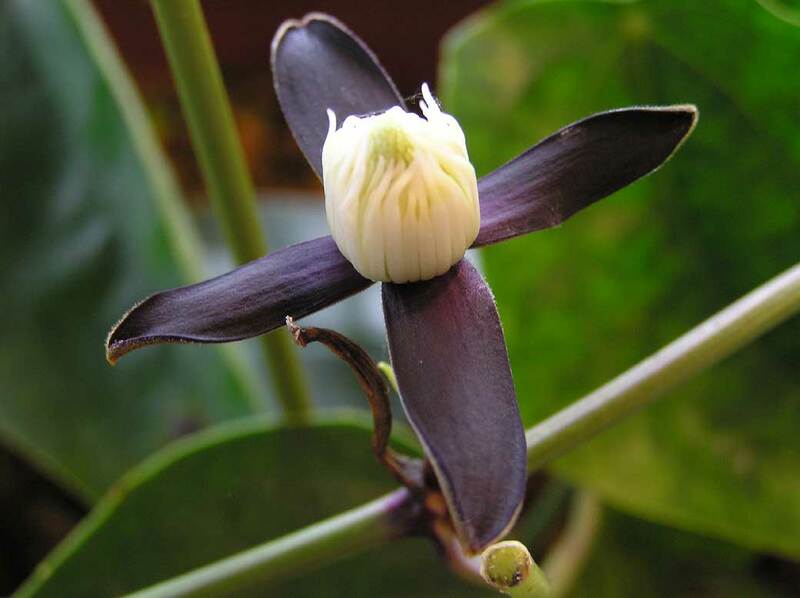 You have an amazing collection of the world's most unusual and hard to find clematis. I hope you'll show us pictures when your new clematis is in bloom ! Crug Farm sells two versions of this species, one with purple star shaped flowers and the other with yellow (which they called Yellow Peril). I have never seen it flower but there are pictures of both of these on their web site. My own experience tells me it flowers over winter so it needs a warm place in a greenhouse or conservatory. I have a plant for years but until now no flower. The temperature in winter is 5 degrees Celsius. I know that Crug Farm has these plants. The flower bloomed on December 14. Mariko, very interesting clematis, love the colour. Does it require special treatment? Does it have any fragrance? A beautiful flower. What is the size? How do you keep the plant because some people in Europe has this Clematis but never a flower. What is the temperature in winter? Keep the kweichowensis in winter rather dry. If your plant has still leaves then keep the plant a little bit wet. Start in spring with watering and fertilizer. This species has a lot of flowers in late summer. I use fertilizer 10:30:20. Today I have collected the seeds. The size of this flower is 1 inch. A scent is regrettable! It did not smell! This flower was got in Okinawa in Japan. There are few differences of the maximum temperature and the lowest temperature. A sense of the season is summer, summer, summer, and winter in general. I don't know about tashiroi, but the crispa picture you are using is of a very attractive plant. Keith, Mariko has used the right picture of tashiroi. Sure it is not crispa. The leaves of tashiro is complete different. Don't worry, I am not going senile! The crispa type picture I was referring to was the one on the left of these pages, which she uses as her 'logo' instead of a picture of herself. I fully agree that the picture of tashiroi she used in the posting is true to type. 'Mona Lisa' is a gorgeous flower, and I hope I am correct in assuming that Hiroshi used crispa somewhere in the cross. Is there any chance at all of a large sized picture of it? I am asking as I hold the National Plant Collection (U.K) of clematis subgenus viorna, and that is a cultivar I have never seen before. I would ask Hiroshi directly, but I believe he is nursing his wife through illness, and I don't want to bother him at present. Did you get the plant directly from him, or is it available in the trade in Japan? Hopefully it might eventually arrive in the U.K. as it looks a cultivar that should be popular over here. I got the seedling of Mona Lisa from Takeuchi. You cannot buy this flower in a market. It is being heard that this flower is the work of Masako Takeuchi. This is hearing the pure line selected from crispa. It is very busy with nursing of its wife. My two plants has new stems, so they are alive. 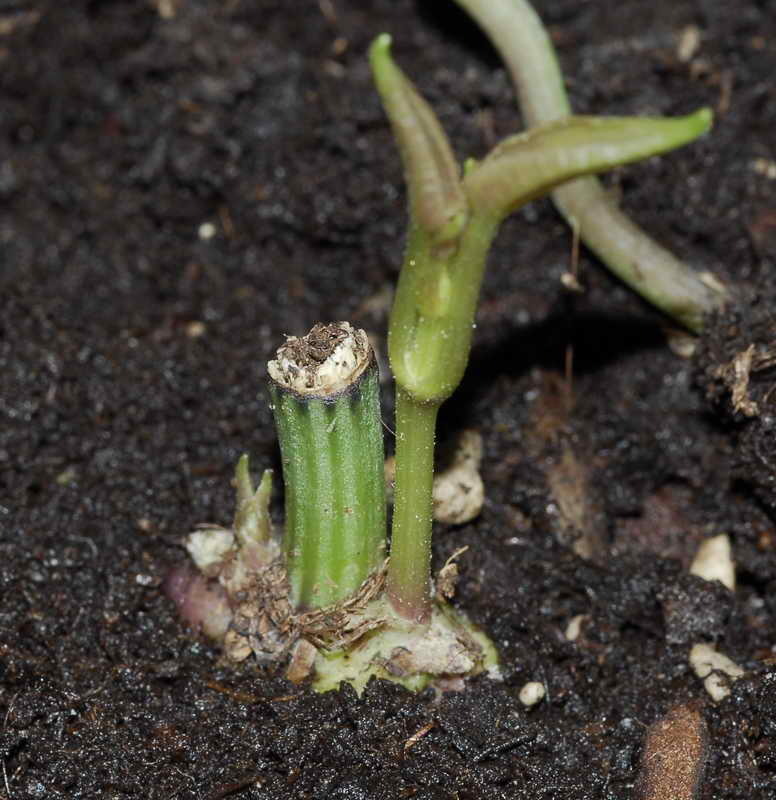 Here a pictureof the cutting with young stem. Ton, thanks for info. My kweichowensis has a few leaves, but does not look very special at the moment, the plant is resting I hope. I look forward to flowers in summer. Mariko, crispa Mona Lisa is beautiful. Just to let you know.... i grew and perservered with C.tashori which i got the year after Bleddyn from Crug Farm brought it back from Asia which must have been 1999 and was smitten with it originally. Sadly this species is not garden hardy for me and is killed outright below -4c. The evergreen foliage with markings are a huge selling point but alas i believe not enough on its own without flowers. I grew one plant under frost free conditions in SW England but the summer warmth/light levels were in my opinion still not hot enough to flower it well, although growth was prolific and it had a great lush tropical feel. In fact i would go so far to say that i am not sure if Crug Farm has flowered it fully. This may seem strange but alot of nurseryman offer material that is wild collected that does not flowerback in the UK and i have had problems with a lot of the evergreen Clematis from sub tropical or borderline temperate areas of Asia. One species that is similar (and from the same sub group) to C.tashori (but in my opinion superior) is C.smilacifolia which has large thick glaucous evergreen elongated heart shaped leaves with red/ maroon markings and beautiful smooth fleshy violet black sepals which curl backwards reflexed and have the contrast of white stamens and these flowers are easily produced in N Europe. This plant was accidentally subjected to -8c/-9c for 2 weeks solidly and resprouted from base but was only cut down by 3/4. This winter i have trialled it outside and has so far coped with -4 for at least 6 nights against a wall. I brought my plant from a flower market in N. Thailand some 7 years ago where it is seen and offered in nurseries.It thrived for me under glass until last years 'accident' but now i have another smaller plant outside. I will post a photo of both foliage and flowers.